Whether you need an off the shelf solution or something more bespoke, we can help. We are specialist manufacturers of One Write solutions (typically applied to visitor pass systems), Contractor Authorisation to Work, Key Control, Goods Received and School Management and Reporting systems. In addition we also run a print facility. We are able to supply business stationery, full-colour literature and short run digital full colour as well as NCR (No Carbon Required) printing. 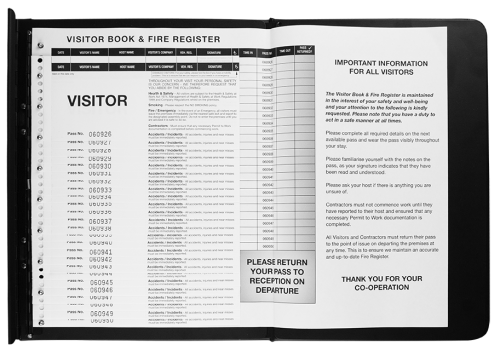 We uniquely manufacture, supply, print and develop all types of visitor management solutions from basic visitor books to portfolio software applications. At all levels we can offer a product that is right for you and your budget, either off the shelf or bespoke to your exact requirements. One writing completes the personalised pass containing Health and Safety information and Fire Register. In addition, the data protection sheet keeps visitors data confidential. Your companies full logo, information, colour and personalisation is available with ‘One Write’ and our dedicated design team can help you create exactly what you are looking for. Click here to view our ‘One Write’ NCR Pass Systems. If you would like all the benefits of the Spiral and Visitor books but would also like the added benefits of Data Protection and reporting, the Combi Multi Pass Visitor System can do this. With a 10 per page pass system this holds all Health and Safety material on the reverse. Click here to view our Combi Multi Pass Books. 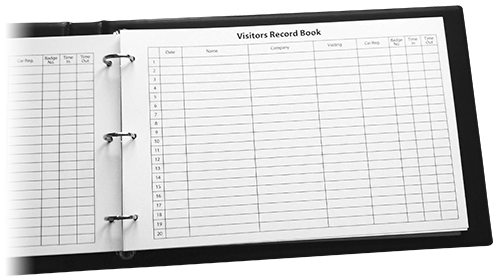 A basic record keeping book that can be refilled for most popular traditional-style visitor stationary books. 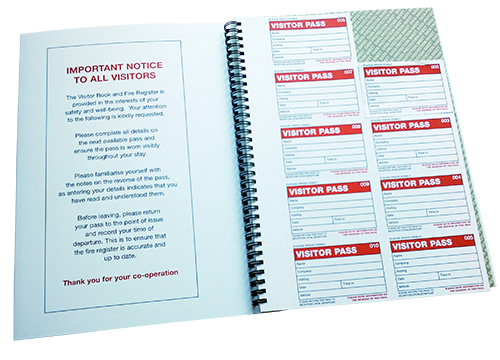 Click here to view our Basic Visitor Books. In addition to our visitor solutions, we can offer other printed solutions to assist with the day to day running of your business. View our full range of visitor management systems here. Contractors must comply with all relevant Health and Safety Law & Company Health and Safety rules. Copies of current Public and Employees Liability insurance must be provided, and a Method Statement on request. To help with the control of permits, we have Permit to Work systems to suit your needs and budget. 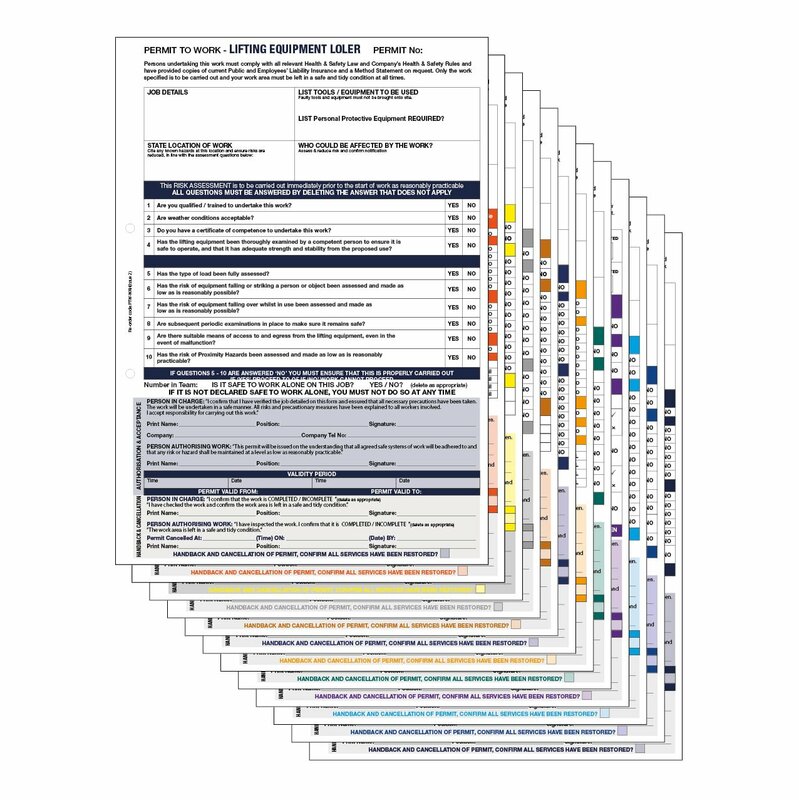 These range from general permit to work issue and control to fully customised, colour coded systems unique to your requirements. In addition to these, we can supply 2, 3 or 4 part ‘no carbon’ cut sets or padded sets. Click here to find out more about our permit to work forms. Create the right impression with a professional reception desk writing board. Securely hold visitor pass systems in place with a durable and stylish cover. We supply writing boards for all the off the shelf pass solutions that we manufacture, with colour options available on some products. 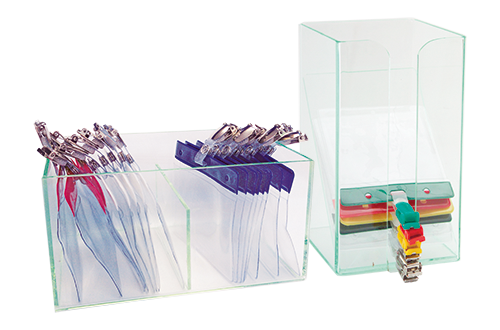 Professional solutions for keeping reception areas organised and tidy. 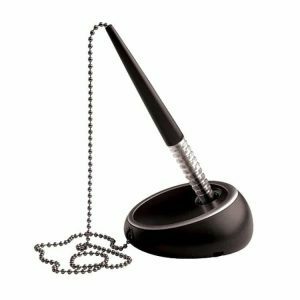 A stylish range of pens, to be used along-side our visitor system for fast and efficient booking-in. Display your wallets neatly at reception. Holds and displays PVC plastic wallets for use with visitor pass systems. The pass is torn from the system and displayed in a wallet to be worn on a lanyard or a clip. Horizontal and vertical versions are available.